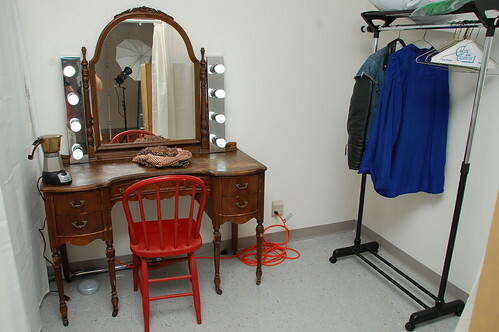 Here is a shot of the dressing area in the new studio. It is not finished, but at least it is now operational. The vanity was donated by a friend (who I just re-connected with after nearly 30 years! ), and while serviceable, is begging for a makeover. Reena is pondering. Feel free to offer suggestions. The lights are color-corrected (6500k) compact fluorescents, and use little power and generate almost no heat. There's 240 watts on each side, so there really is great light for applying makeup and doing hair. My first paying shoot is tomorrow. I am really looking forward to a session in this great new space. Do not expect to see model pictures right away because the photos cannot be released until after a certain date. Now, what am I forgetting..? Hello Dear Reader! They are not fancy! They came from Menard's, though I would expect any decent lighting store to carry something similar. I have also seen them at ReStore. I think I paid about $12 each, not including the color-correct CF bulbs. I bought an appropriate cord and plug and wired them myself - pretty simple if you know the basics. I have no switch on them, so we just plug them in when needed. I don't have a lot of people doing fancy makeup, so it suits my current needs. Some angle brackets on the bottom could slip under the mirror to keep them in place.